As the city of Asheville considers how to redevelop sites in its busy and historic downtown, researchers at the Renaissance Computing Institute (RENCI) at UNCA are assisting officials with a tool that models design alternatives in an interactive, three-dimensional environment, according to a blog post on RENCI’s site. A new RENCI-developed model of Haywood Street and the Civic Center/Basilica of St. Lawrence Plaza was unveiled at a meeting at the Asheville Design Center on Wednesday, March 17. The model uses geo-referenced data to create an accurate, 3D animation of a portion of Haywood Street that includes the Asheville Civic Center, the adjacent Basilica of St. Lawrence, and a parcel across the street that includes a small parking lot and an empty storefront. 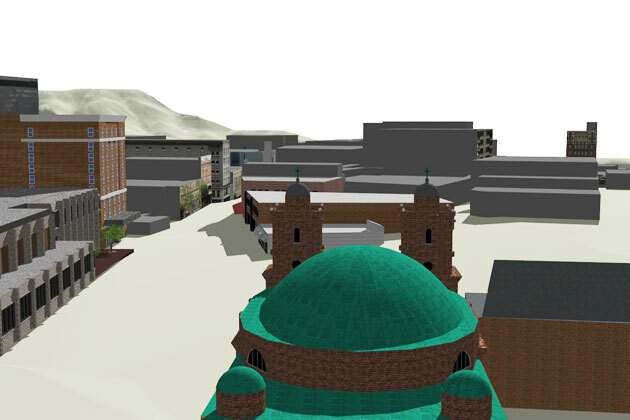 RENCI’s 3D model looking south down Asheville’s Haywood Street with the Basilica of St. Lawrence (green domed roof) in the foreground. 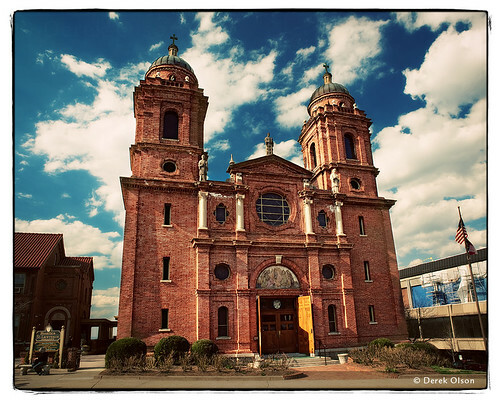 The city wants to redevelop that parcel but is sensitive to how redevelopment could impact the 100-year-old brick and stone Basilica, which sits on high ground at the north end of the street, its impressive façade viewable for several blocks, says the RENCI site. The new RENCI tool creates a geo-referenced model of Haywood Street’s buildings, sidewalks and the street—complete with landscaping and architectural details so that users can easily recognize the locations in the model. When completed, the model will use the Unity 3D video game engine to allow users to walk around and view details from different perspectives, much as they would in a video game. My photo of St. Lawrence appears on Google Earth/Panoramio, along with several others of this beautiful and historic building. I will check out this interesting planning model.